The rotator cuff is a group of four muscles in the shoulder, the subscapularis, supraspinatus, infraspinatus and teres minor. 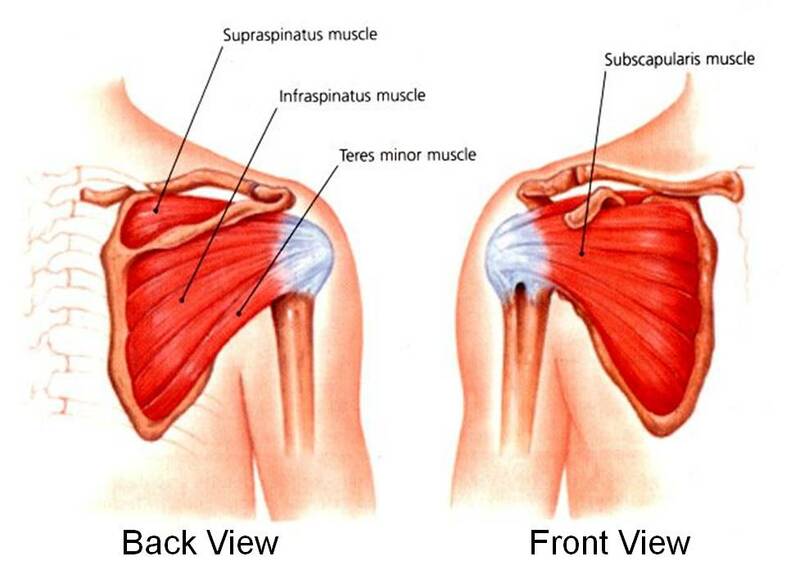 These muscles function to operate the shoulder through its range of motion. They also provide stability to the shoulder joint. The shoulder joint is a ball-and-socket joint made up of three bones, the humerus, scapula and clavicle. Injury to the muscles and their tendons can occur through trauma. Tendinitis can also occur in the attachments of the muscles. The rotator cuff also includes a bursa, which is a lubricating sac that sits around the joint. This bursa can also become inflamed and cause pain. The patient with a rotator cuff injury will have weakness of the shoulder muscles and have difficulty moving the arm above the level of the shoulder. Athletes are prone to rotator cuff tears, as are patients that have jobs requiring lots of over-the-head activity such as painters or carpenters. Evaluation of the patient with a rotator cuff tear begins with a history and physical exam by a physician. Any history of trauma will be noted, as will job related issues that may cause or worsen the pain. Physical examination will look for neurological problems as well as weakness and limitations of the range of motion of the shoulder joint. Xrays and MRIs of the shoulder are useful to look for shoulder diseases as well as other problems that may mimic rotator cuff problems. The treatment of rotator cuff problems begins with conservative modalities such as non-steroidal anti-inflammatory medications and physical therapy. Injections in and around the shoulder joint with a dilute solution of a local anesthetic and a steroid can relieve the pain temporarily and facilitate physical therapy. If conservative modalities and injections are unsuccessful, then a surgical repair may be necessary.